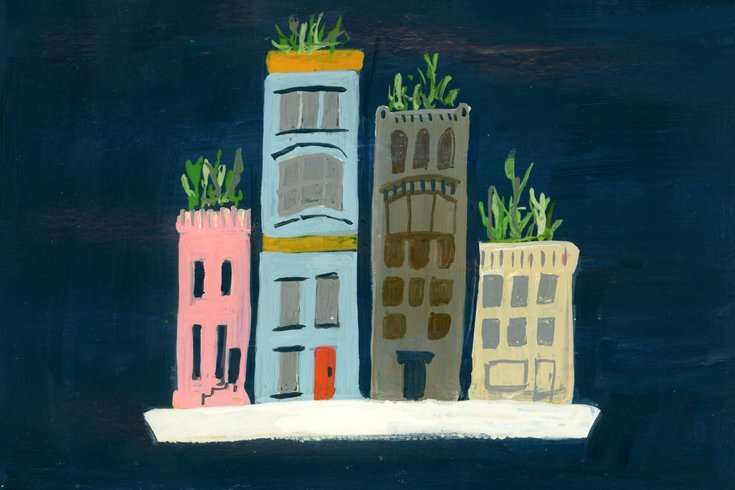 "Floating City" by Terri Fry Kasuba, part of Space 1026's "Philadelphia 2076" exhibition. What will life in Philly look like 60 years from now? The contention over the city’s best cheesesteak will be rendered obsolete by the nutrient packets we download into our digestive tracts, no doubt, but what about the skyline? For Space 1026’s new group show, more than 30 local artists envision the Philly circa the tricentennial. The show is the collective brainchild of three artists: Miriam Singer (creator of abstract cityscapes and cartographical drawings), Ryan Beck (painter of dreamy watercolor strokes slashed with bold lines and shapes) and Conrad Benner (arbiter of the local street art scene and founder of the Streets Dept blog). They were “all wondering about the future, as we are in the midst of presidential campaigns,” Singer says. Try to repress the image of Dilworth Plaza’s rebranding as President Trump Square. Deep breaths. Even if you don’t partake in the co-working community at Indy Hall (full disclosure: I am currently a member there), you might have heard the space doubles as a showplace for eclectic art exhibitions — and will continue to even after moving to a new location nearby. Artist Sean Martorana currently operates Indy Hall Arts, where he has helped create more than 25 exhibitions since 2012. "Full Bonkers" is a retrospective of the last four years of art at Indy Hall’s Third Street spot, bringing together work of all types from all types of people. Most of them aren’t full-time (or even really part-time) artists, just folks who want to create something together, like badass 3-D printed sculptures. Melissa McCullough's 'Garden of Zoological Stitches,' on display at Philadelphia Independents. First Friday events and shows have spread out throughout the city, but Old City is the OG when it comes to flinging open the gallery doors and busting out the free booze, and the neighborhood’s celebrating a quarter-century of doing just that. 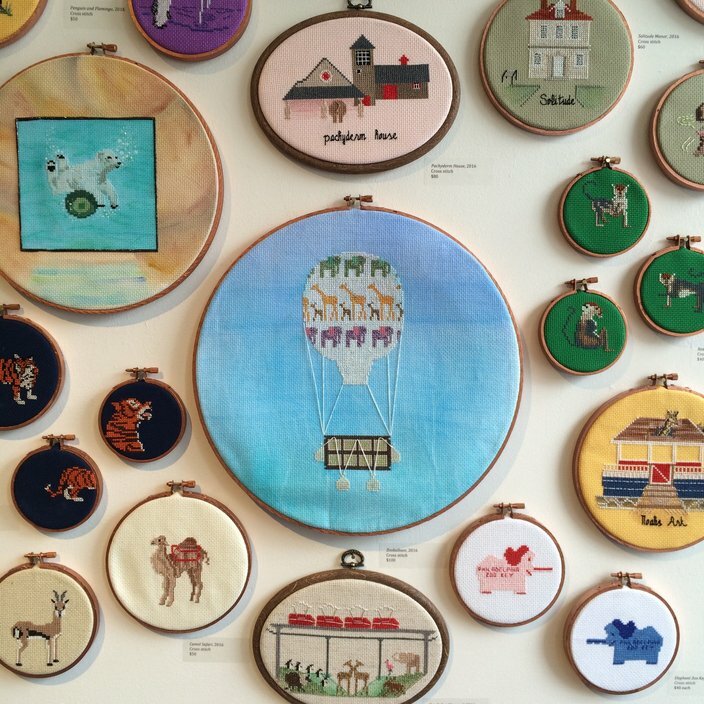 Here’s an event that just plain sounds delightful for a sunny Friday evening: Melissa McCullough’s created cross-stitch pieces depicting the history of the Philadelphia Zoo and all its animals and architecture. America’s had some bad zoo news this week, people. This’ll be a pick-me-up. Klip Collective artists (they’re all about tech, projection lighting and storytelling in art) have created a project seeking to “capture the history and tangible memories contained in” South Philly’s shuttered Bok Vocational Technical School. Inside the gymnasium, find large-scale video projection, virtual reality, innovative sound design and found items from Bok, like instruments and yearbooks. Benner from Streets Dept got a first look and says the installation right now is mostly pictures and recordings from the 1940s and 1950s. The “Vacant America” project, Klip Collective says, is all about “uncovering physical memories from America’s forgotten and changing spaces.” We know there’s a whole thing about the Bok building’s use, pop-up bar on the roof, etc. But how could this exploration into its storied history be anything but positively… educational? Have you ever seen Emma Fried-Cassorla’s paper and woodcut maps of Philadelphia? You should really see Emma Fried-Cassorla’s paper and woodcut maps of Philadelphia. She’s got small- and large-scale (as in big-as-your-body large) intricate, laser-cut maps of the city, down to every tiny city block, and they will be on display here, along with Cooper O’Neil’s gorgeous stained glass maps of the same. Think of them as love notes to the city. Hey, that was the name of Emma’s blog.